• Leak Investigations: When chronic leaks or unusual weatherproofing issues persist or when a second opinion is needed. • Storm Damage Assessments: Fast, effective way to assess the type and amount of damage incurred as well as recommendations on temporary and permanent repairs. • Emergency Storm Response: Provides important response service to document storm damage and rooftop conditions and to assist with temporary protection design and coordination. • Infrared Thermography: A very useful tool to enhance many of our consulting functions. 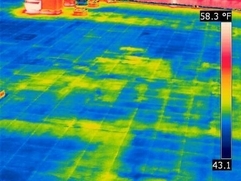 Infrared thermography can locate leak sources, identify wet areas, and assist in mitigating future problems associated with chronic, unresolved leaks. Our emergency services can prevent a problem from becoming a disaster. Quick response is the most effective way of mitigating issues that come with major roofing problems and associated downtime. By arriving at the scene, we can immediately assess the condition of the roof and determine the type of emergency and temporary repairs that will be needed. We can photographically document all conditions and be available to meet with your insurance representative. Infrared Thermography is an excellent tool in certain applications for leak source, and water migration investigation. An IR inspection can quickly and accurately determine where leaks are occurring and how much roof area has been impacted. In reroofing applications, an IR inspection allows better planning of wet insulation replacement or anticipation of deteriorated deck replacement. This can be critically important information when operating within a limited capital budget. An IR inspection can help solve chronic leak issues that ordinary inspections may not be able to resolve.